In Volume 2 of the bestselling Forbidden Doors fiction series, author Bill Myers presents books 4--6---The Haunting, The Guardian, and The Encounter---which keep readers on the edge of their seats as he tells stories about the young adults who battle dangerous occultic influences in their lives. Biblical truths about spiritual warfare have never been so suspenseful and entertaining. - Publisher Some doors are better left unopened. Join teenager Rebecca 'Becka' Williams, her brother, Scott, and friend Ryan Riordan as they head for mind-bending clashes between the forces of darkness and the power of God. The Invisible Terror Collection brings together three fast-paced novels of the supernatural by bestselling author Bill Myers. The Haunting Becka and Scott's greatest enemy is the owner of an occult bookshop. She is requesting their assistance, but helping to conduct a seance is out of the question. Is it really the spirit of a little girl who is haunting the old mansion in town ... or something far worse? The Guardian Who wouldn't welcome protection, guidance, and the path to enlightenment? But the 'spirit guide' who claims to offer them to Becka's friend Julie is sugarcoating a sinister lie---one that threatens to entangle them in the darkest deception of all. The Encounter When Krissi starts talking about receiving mysterious messages from an alien being, only Becka takes her seriously. More is at stake than anyone realizes, and Becka is up against one of her strongest and most frightening enemies yet. About "Invisible Terror Collection (#02 in Forbidden Doors Collection Series)"
Some doors are better left unopened. Join teenager Rebecca 'Becka' Williams, her brother, Scott, and friend Ryan Riordan as they head for mind-bending clashes between the forces of darkness and the power of God. 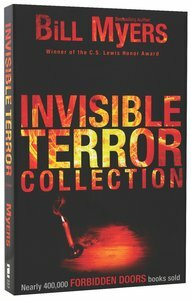 The Invisible Terror Collection brings together three fast-paced novels of the supernatural by bestselling author Bill Myers. The Haunting Becka and Scott's greatest enemy is the owner of an occult bookshop. She is requesting their assistance, but helping to conduct a seance is out of the question. Is it really the spirit of a little girl who is haunting the old mansion in town ... or something far worse? The Guardian Who wouldn't welcome protection, guidance, and the path to enlightenment? But the 'spirit guide' who claims to offer them to Becka's friend Julie is sugarcoating a sinister lie---one that threatens to entangle them in the darkest deception of all. The Encounter When Krissi starts talking about receiving mysterious messages from an alien being, only Becka takes her seriously. More is at stake than anyone realizes, and Becka is up against one of her strongest and most frightening enemies yet. Bill Myers is the author of the humorously imaginative The Incredible Worlds of Wally McDoogle series, which currently numbers 27 episodes and over 2.1 million units sold. He is also the creator and writer of the McGee and Me! video/dvd series. Myers is a director as well as a writer, and his films have won over forty national and international awards. He has written more than 50 books for kids, teens, and adults. Myer's work is enjoyed by millions around the world. He lives with his wife and two daughters in Southern California.- Publisher.